← Moral Turpitude – Should an employer assume the role of Moral Police? I just saw the Tata Tea ‘Power of 49’ advertisement. The ad suggested that women are 49% of the voter base and have the power to change the election results. The idea seems interesting, let’s analyze the voter data of the past elections. 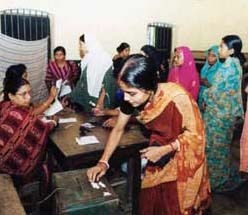 As can be seen above, the majority of the voters were women which is as high as about 60% in the year 1999. Therefore, as per the above data, women have higher political representation and it is seen that a dominant group is one which has more political representation as they control the law making in a democracy. Please Note: If you have any concerns with any part of this article, do feel free to comment. Your concerns will be appropriately addressed and/or modifications to the article will be made. Women voters were as high as ~60% in the 1999 elections, thus clearly in majority. And this could also show the political strata that men have the swing vote if they unite….